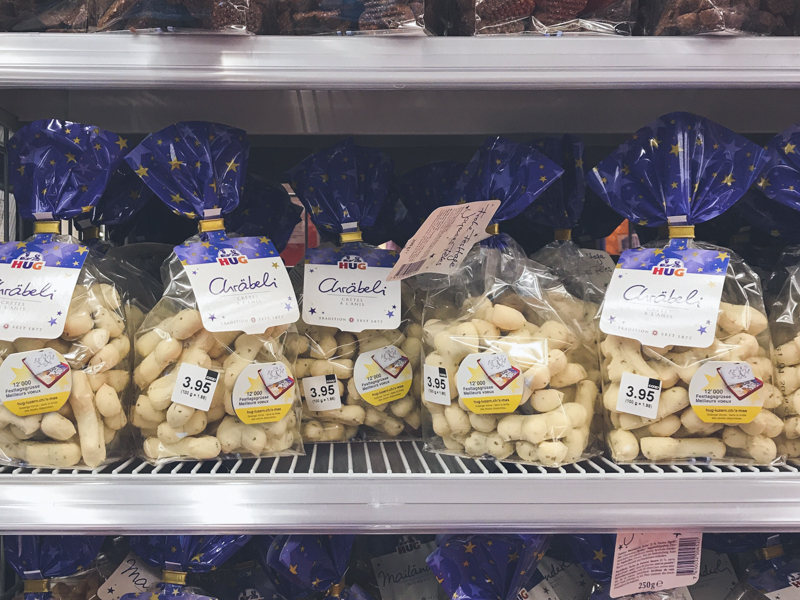 Here in Switzerland the marking of “it’s time to start preparing for the holidays” doesn’t begin when the twinkling lights start to illuminate the winter darkened streets or the department stores start to fill their shelves with festive decorations and treats. But rather when the local supermarket fill their centre aisles with bulk packs of sugar, flour and butter at discounted prices. It is time to forget about that no-sugar diet and start baking Swiss Christmas cookies. The Swiss take their Christmas cookies very seriously; there is even a song dedicated to the different types (check out the video below). While you can buy them in the shops, and to be honest, I sometimes will too, there really is nothing like homemade. The baking of cookies in our family is mostly left up to my mother in-law who will make big batches of our favourites over a few days and then cleverly bring out small batches of them over the holiday period. Growing up in Australia, other than a bright blue tin full of danish sugar cookies, cookies rarely featured. We’ve celebrated one Christmas as a family in Australia 9 years ago, and it wasn’t until we stumbled upon “zimtsternen” at an international Christmas market in Brisbane that I realised how important Swiss Christmas cookies had become in getting me into the holiday spirit. While I don’t personally go all out when it comes to Christmas cookies, I leave that up to my mother and sisters in law, I do like to bake up a couple of our personal favourites: zimtsternen for me and mailanderli for hubby. Tip: I find using wooden sticks called “Teighölzli” makes light work of keeping the cookie dough even when rolling out. Here is something similar on Amazon. Once those cookies are baked, they are stored in cookie tins and kept in a cool/dry place to give out during the season. It is not unheard of for my mother in-law to offer a “spitzbub” close to my birthday in January, if they are stored correctly, they really can last that long. 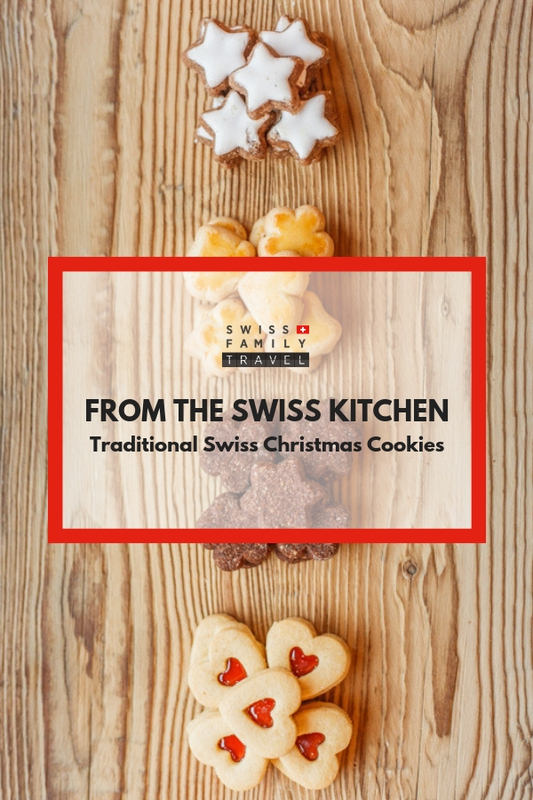 While each region will have their own speciality or variation on the traditional cookie, there are a few types that are found in most Swiss households during the advent season. Probably the most famous of the lot, Zimtsternen or Cinnamon Stars are my very favourite. This is one cookie I also don’t mind store-bought. They’re made of ground almonds, cinnamon and egg whites and topped with an egg white icing. While I use this German recipe from Betty Bossi, here is an English recipe from BBC food. Two melt in your mouth butter cookies sandwiched together with homemade jam and dusted with powdered sugar. They look best when one half of the cookie sandwich has a decorative hole in the middle. Helvetic Kitchen has a recipe to try here. A butter cookie with hints of citrus glazed traditionally with an egg wash before being baked. I however much prefer the untraditional route of lemon icing. Check out Helvetic Kitchen’s recipe here. Ground almonds flavoured with cinnamon and cloves and turned brownie like in color thanks to cocoa powder. Check out the recipe from Little Zurich Kitchen here. For the Aniseed lovers out there this is the cookie for you. I personally am not a big fan so don’t have a go to recipe, but give this Martha Stewart one a go or if you can figure out the german, this recipe from Betty Bossi. If you are Swiss-based or visiting during the holiday season and don’t feel like baking them yourself, check out the range of pre-made cookie dough available in the fridge section of the supermarkets. They don’t taste as good as the made-from-scratch but are a fabulous alternative that make your home smell wonderful. Want to get baking? Enter the November giveaway for a chance to win a copy of Swiss Cookies by Andrew Rushton and Katalin Fekete. CLICK HERE TO ENTER.